Now if your still confuse about the boat after these Buying tips, and you still want to hire a Marine Surveyor here are some tips that I found out from other customers and what to look out for. See if the Surveyor has or uses a Disclaimer clause in his report. This Clause Protects the Surveyor if you happen to find something on the boat that he misses. This is the number one complaint that I hear from customers, and the customers tell me that they can't do anything about it because of the clause in the report. They even tried to report them to the agencies that certified them, and they don't want to be bother with them. So now your paying a surveyor maybe $800 and up, to check out your boat that your thinking of buying, and at the end of the report it says that he's not responsible if he misses something. Then I feel you can save some money and do a good job yourself if you follow my tips. Now you brought the boat on his recommendation and you find you have some problems. Rotten Transoms, Stringers, Engine mounting blocks, Floors, seem to be the biggest problems. To repair these problems it can cost thousands of dollars. I've seen customers get so disgusted with their boat and what it would have cost to repair that they actually took a Chain Saw to the boat, and cut it up into little pieces. Make sure that the surveyor is insured. Ask to see the certificate, and just to be really sure call the insurance company and see what the policy covers. It would also be nice if he was bonded. But your not going to find that. 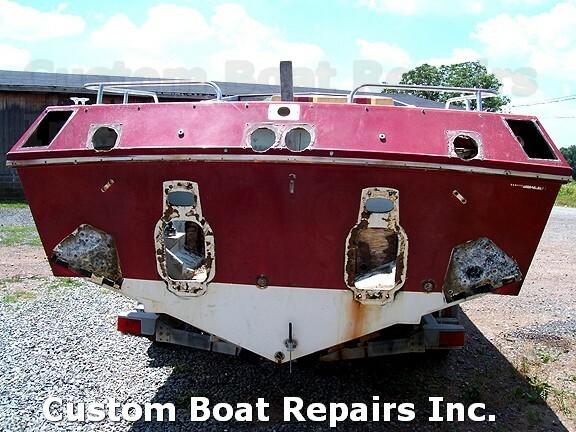 Case in point.A customer brought a boat that the surveyor says was in great shape. While the customer was cleaning the engine compartment, getting it ready for the water, he notice some wood flaking by the battery shelf, when he touch the area with his hand it went right through the wooden shelf, and the batteries fell through. Well, I can say he was very mad. Now towards the end of the situation. After a year and a half doing the paper work to take him to court, the boat owner wins in court. The judge rules in his favor. Now the customer tries to collect the damages. Well to his surprise during that year and a half the surveyor took all his assets out of his name and transfer them to his girlfriend. Well in the end this boat owner was not happy. When your looking for a Surveyor. Check him out like you would if you were looking for a doctor. If you don't, you may need the doctor after the experience. Check out Marine organizations like "SAMS" ( Society of Accredited Marine Surveyors) or "NAMS" (National Association of Marine Surveyors). The feedback I got from customers is that when they filed a complaint against the surveyors to the organizations, is that they couldn't be bother with them. I feel that if you belong to an organization and if there are more then, lets say six complaints against you, they should pull your license or certificate. Good Luck at that. Do not use a Surveyor that the owner of the boat used. I've seen this happen a lot. Find somebody else out of the area. Do your research on the internet. Search the type of boat your looking for. See if there are problems with that type of boat. There are many good sites for this info. I'll be putting some links in my links section. Find a surveyor that uses a Moisture Meter and knows how to use it. It's a very tricky device. You can get alot of false positives readings. Also a Surveyor that uses a Infrared Camera would be good if he knows how to use that too. The Infrared Camera can show things that the human eye can't see. Also that camera is very Expensive. I brought one for $15,000.00 and Its worth every penny. Ask him questions about the boat in question. See if that boat had any problems with the hull. This is another complaint that I hear alot. Lets say "Surveyor Joe" looks at a boat for a customer thats interested in a boat, but decides to back out of the deal, he pays the surveyor $1,000.00 for the report. Now a week goes by and another customer looks at the same boat. The customer starts calling marine surveyors to see who he'll hire to check out his boat. He finds the same surveyor that checked it last week. The surveyor says that he already check that boat out and he wants $1,000.00 to check it out again. This customer got so mad that the surveyor wanted another $1,000. He then tracked down the previous customer and got the report for free. 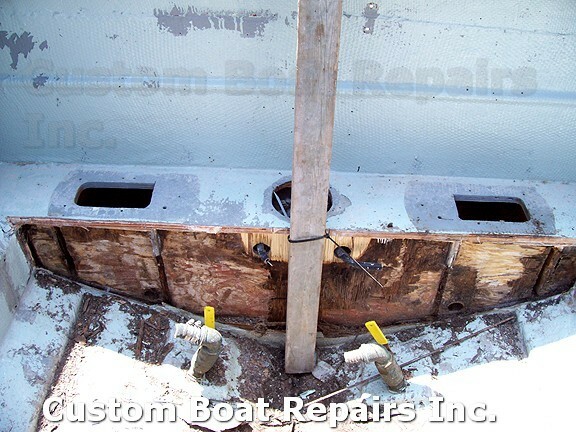 Here are Photos of a boat that a Surveyor checked out. The owner paid $450.00 for the report. 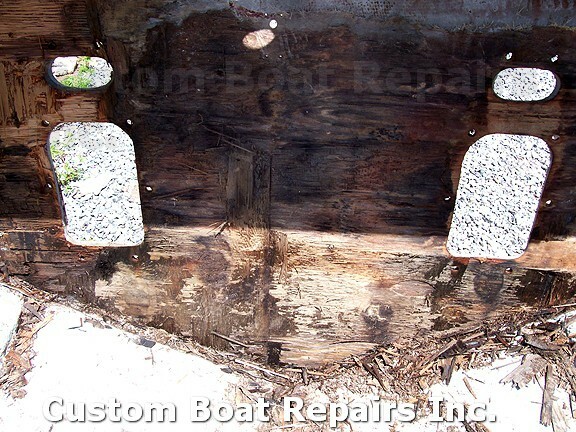 The owner called me and asked for my opinion on the boat without me seeing it, and how much it would cost to fix the bulkhead that the surveyor told him it was rotten. 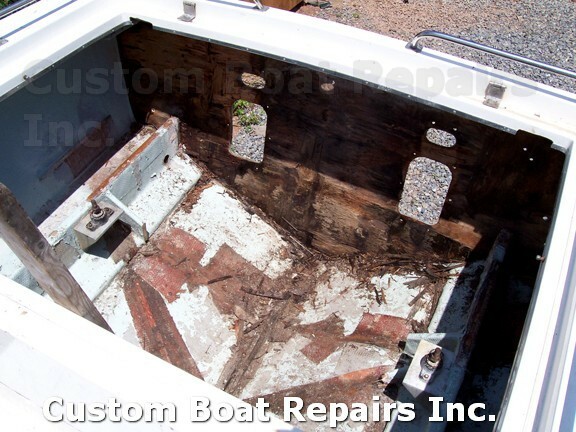 When he told me the bulkhead was rotted out, I told him to pass on the boat. He didn't take any photos of the boat for me to check it out. Only after he bought the boat he sent me photos. If I saw these photos before I would have screamed at him to find another boat. Well the boat looks terrible now in these photos. This is because when he started working on his boat he found out that the transom was rotted out, the engine mounting tabs let go. He then proceeded to cut the inside apart to see how much the boat was rotted out. Well it was all rotten. The surveyor didn't even see this. After I gave him a price to do the repair he felt it was better to strip the boat of its motors, drives, and sell them, and cut the rest of the boat up with a chainsaw. Also he tried going after the surveyor with no luck. Now don't get me wrong. There are a few Very Good surveyors around. Its just hard to find them.